I recently tried out this great copper Moscow mule mug from Bemazed. I love these new copper cups. I recently saw them on a design show where the designer was using them as the decorative piece in a kitchen, but I loved that they were usable. I am not the type to have extra items in my kitchen for decor, it needs to be usable! So I love these copper cups. I really like that after you use them they become aged and look worn. I love the look of them. The more worn the more interesting it becomes. Apart from the use of them as a decorative piece they also are great cups. The copper has a property that keeps drinks extremely cold for a long period of time. Mine lasts for hours! There is not any nickel, steel, or tin so you don’t have to worry about any negative chemicals getting into your drink. They are completely safe to use. We use ours all the time, it’s our main drinking cups in the kitchen. FEEL LIKE A KING OR QUEEN WITH THIS MUG IN YOUR HAND… This eye-catching, 16 ounce, authentic Moscow Mule mug is 100% solid copper throughout, not stainless steel or nickel. Our Moscow Mule copper cups feature a beautifully hammered finish with a tarnish resistant, food-safe lacquer coating both on the inside and outside of the mug to protect its natural beauty and luster for years to come. 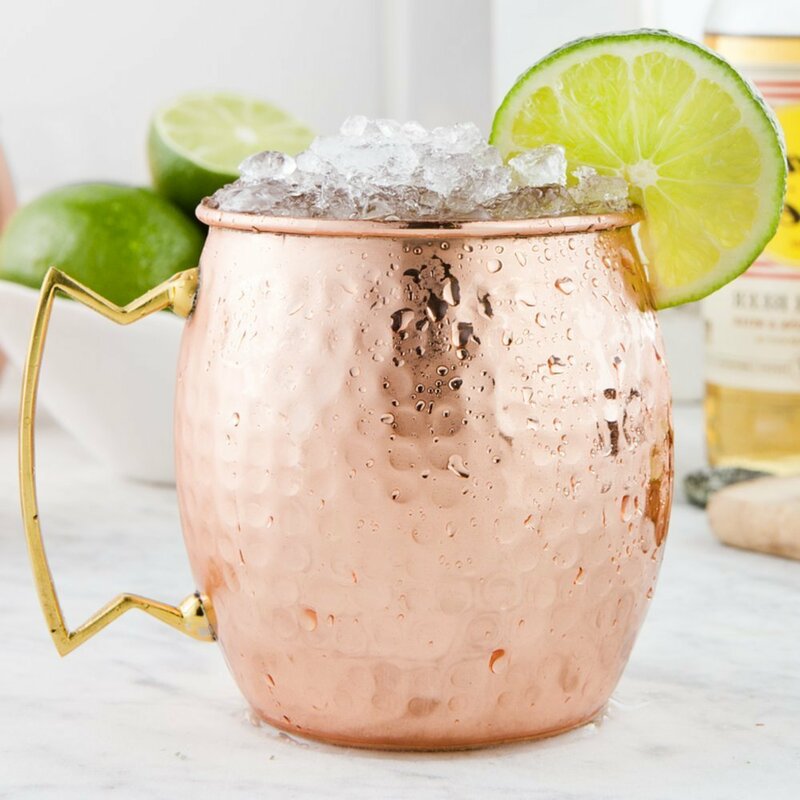 OUR MOSCOW MULE COPPER MUGS KEEP ANY DRINK ICY COLD FOR A SURPRISINGLY LONG TIME… Perfect for any cocktail, iced tea, soda, water and any other cold drink! Keep this mug in the freezer so you are ready for an impressively cold, refreshing drink anytime! Our Moscow Mule mugs feature a brass handle that does not transfer heat from your hand to the mug. GIVE A FUN AND CREATIVE GIFT – MAKES A GREAT ADDITION TO ANY BAR… Order a Moscow Mule set as a gift and watch the recipient’s eyes light up with excitement. Impress your friends and family with a fun and unique conversation starter. Each mug is handcrafted and makes a perfect gift for birthdays, holidays and any other occasion. SUPER EASY TO CLEAN AND TAKE CARE OF… Hand wash with warm water and liquid dish soap. Towel dry with a soft cloth and you’re done! It’s that quick and easy. When you order today, you’re protected by our NO RISK, FULL MONEY BACK GUARANTEE! You can order it from Amazon!